Inventor Thomas A. Edison wrote, “Opportunity is missed by most people because it is dressed in overalls and looks like work.” The diva life is one that looks graceful, easy, and fun on the outside but looks like a lot of work when up close. 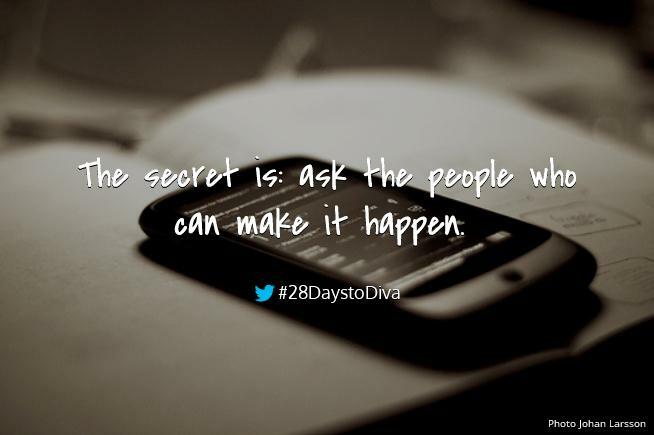 28 Days to Diva is all about getting to work and making your own opportunities. Any singer can fly by the train of her gown for a while, but a diva needs planning, organization, and systematic follow-up to ensure she is getting the gigs that will propel her career. Every phone call you make and every email you write can lead to your next gig. Including booking sessions in your daily administrative work will increase your bookings exponentially. We want the momentum from these booking sessions to act like compounding interest. You will use these scripts to familiar and new presenters to build name recognition and establish yourself in the local/regional performance scene. That buzz will help you get gigs on top of other gigs. You are aiming for various opportunities during these booking sessions which include both auditions and performances. Remember, the entire business idea in singing is to get better gigs and make your number without going crazy. Do you know all of the possible performance venues in your area? Start filing your venue information forms away for performance spaces in your immediate area first. Then, branch out and keep adding forms for regional locations. Traveling for an upcoming gig? Add some venue forms to your folder for that area. If you are able to think outside the box, there is no limit to the potential performance spaces available to you. Most of this information is easily accessed on websites these days. You will need to call, however, if you cannot find the specific information on their site. Most singers do not have the luxury of being afraid to talk on the phone. At some point, you just need to get over it and start dialing. If you do still have a nagging insecurity about phone calls, I have a couple of tips for you. First, use your superior acting skills to create a “booking persona” you use when you call. A second option: outsource the cold-calling of venues for information. Maybe you have a family member that is a charming phone-talker and would like to help you out in their free time. Perhaps you’re one of those lucky singers with a bit of disposable income to spend on an assistant with Fancy Hands or a similar company — if you’ve ever thought, “I need a personal assistant!” This is it. When you are the one calling, practice positive, open-ended questions. You want to avoid all instances for them to say “no” all while getting as much information as possible. Instead of “do you present concerts?” you could try, “what types of performances do you present in your space?” That question is more likely to elicit a longer, more informative answer. Try to reach the specific person who has the ability to book you and not too high-up that you’re bothering the Executive Director with an information-gathering phone call. On the opposite side of the spectrum, the box office staff will only have so much valuable information for you and probably has little influence on which acts get booked. Stretch your fingers because writing venue scripts is something that you’ll need to do on your own. Who knows your project/recital/voice better than you? Schedule some time during your “office hours” or admin sessions to compose multiple scripts to be used for various performance opportunities. Anticipate the scripts you will need: auditions, festivals, performing arts centers, bars, coffee shops, art museums, house concerts, etc. You will want your scripts to be appropriate for both phone calls and emails. Your script for a new venue is going to dovetail with the information-gathering activity described above. Figure out whether the presenter likes to be contacted via email or telephone. Then, once you have gathered the information necessary you can begin to express your interest in performing there. This first call is not the time for negotiating with new venues or familiar presenters. Your goal in the first call is to decide whether or not the venue is right for you and to be able to send them your materials. Once you have the information for your form, you will be able to better negotiate your fee later. You should absolutely cover the time frame in which you will be able to present your project or performance in their area. Then, ask the promoter what materials would be helpful to them. Offer to send your digital press kit for the project. Your enthusiasm is contagious. Let your personality and professionalism shine through your communication. Once you have had a successful performance with a venue which demonstrated your ability to draw a sizable audience, you are in a better position to offer them a future event. Develop a script that you can use as the outline of your conversations with familiar presenters. This script is a foundation to explore possible performance opportunities. Does the venue also have a festival? Suggest another performance that coordinates with their programming. Keep solid stats about your performances – number of tickets sold, total revenue, even bar sales if you think it will help seal the deal. Refer to those stats in your communication. Know your goals before you initiate conversation. Do you want them to book you for a performance? Want to schedule an audition for a conductor? Focus the conversation on the desired outcome. Doesn’t it just make more sense to be in charge of your career rather than feeling like it is all up to chance somehow? It is really your responsibility to make a living at this career. No one is coming to save your career and make you a superstar overnight. Every phone call you make and every email you write can lead to your next gig. When you are an emerging singer you need to spend more time reaching out. The secret is: ask the people who can make it happen. Oh boy, divas, I want to hear your stories about how you made your own opportunities! Pretty please tell me about it in the comments below. Those stories are so full of inspiration and motivation. Did you find this post to be inspiring or motivating? I sure would appreciate it if you would share Day 19 via your favorite social media channels. If you tweet, feel free to add @mezzoihnen or hashtag #28DaystoDiva so we can follow along!